Introduction Intervention studies have mainly used oral nutritional supplements (ONS) for the management of patients with chronic obstructive pulmonary disease (COPD) identified as at nutritional risk. In this 12-month randomised feasibility trial, we assessed the (1) feasibility of the recruitment, retention and provision of two interventions: ONS and between-meal snacks (snacks) and (2) the potential impact of the provision of snacks and ONS on body weight and quality of life in patients with COPD. Methods Hospitalised patients with COPD, at nutritional risk, were randomised to ONS (n=19) or snacks (n=15) providing 600 kcal and 22 g protein a day in addition to regular daily diet. The intervention started in hospital and was continued for 12 months after discharge from the hospital. Results Study recruitment rate was n=34 (45%) and retention rate at 12 months was similar for both groups: n=13 (68%) in the ONS group and n=10 (67%) in the Snacks group. Both groups gained weight from baseline to 12 months (2.3±4.6 kg (p=0.060) in the ONS group and 4.4±6.4 kg (p=0.030) in the Snacks group). The St George’s Respiratory Questionnaire total score improved from baseline to 12 months in both groups (score 3.9±11.0 (p=0.176) in the ONS group and score 8.9±14.1 (p=0.041) in the Snacks group). Discussion In patients with COPD who are at nutritional risk snacks are at least as feasible and effective as ONS, however, adequately powered trials that take account of the difficulties in recruiting this patient group are required to confirm this effect. Are between-meal snacks and oral nutritional supplements (ONS) feasible and effective on weight change and quality of life (QoL) in hospitalised patients at nutritional risk? Both groups gained weight of more than 2 kg from baseline to 12 months and QoL significantly improved from baseline to 3 months in both groups, and improvements from baseline to 12 months were of clinically relevant difference in both groups. Our findings imply that snacks are at least as feasible and effective as ONS and were associated in greater improvements in QoL, however, future trials should be informed by the recruitment and retention issues that have been raised and practical issues of undertaken functional measures in this population merits further consideration. Since the arrival of ‘ready-to-use’ ONS, the use of food-based strategies seems to have declined12 and data on patient-relevant outcomes are lacking.12 13 There are also significant financial and practical differences associated with ONS and snacks, which, in the absence of clear evidence to inform decisions, have influenced choice of supplementation method. In order to investigate the potential role of energy and protein-dense food for patients with COPD, the aims of this 12-month randomised intervention trial were to study the (1) feasibility of the recruitment, retention and provision of each intervention, and (2) the potential impact of the provision of snacks and ONS on body weight, and (3) quality of life (QoL) in patients with COPD. Patients with a clinical diagnosis of COPD who had been recently admitted to the Department of Respiratory Medicine at Landspitali University Hospital were screened for possible nutritional risk (score ≥4) by a trained researcher using a validated nutritional screening tool.3 15 The Icelandic Simple Screening (ISS) used is recommended by the clinical guidelines for hospital nutrition at Landspitali,16 and has been validated against a full nutritional assessment in patients with COPD3 and predicts mortality in patients with COPD.15 ISS gathers information on body mass index (BMI), unintentional weight loss, age, comorbidities, recent hospitalisation and a range of symptoms that impact nutritional intake during the last weeks or months (vomiting, diarrhoea, loss of appetite or nausea, difficulties in chewing or swallowing). All eligible patients who were able to eat orally, and had an anticipated length of hospitalisation of >3 days were invited to participate in the study. The most common reason for admission was acute exacerbation of COPD. Written informed consent was obtained from all participants. Patients diagnosed with cancer, dysphagia, food allergy or intolerance and anatomical obstructions preventing oral food intake were excluded. Patients not able to sign informed consent due to cognitive issues were also excluded. Sociodemographic data (age, gender and smoking status) were collected from electronic medical records SAGA (TM software V.3.1.39.9). Eligible patients were randomly assigned in a 1:1 ratio to either an ONS group (ONS) or Snacks group. Random sequence generation was performed using randomisation codes produced by Microsoft Excel for Windows 2007. Randomisation, allocation of patients to groups, nutritional intervention and outcome assessments were performed by one researcher (ARI). Due to the nature of the intervention it was not possible to perform a blinded study. Randomisation took place after screening for nutritional risk and prior to baseline assessment. This study was originally designed as a randomised trial to investigate the effects of snacks on body weight and QoL in patients with COPD compared with ONS with a planned enrolment of 200 subjects (ClinicalTrials.gov, number NCT02251496). Despite screening 492 subjects, only 76 were eligible indicating that recruitment is challenging in this population and clinical setting. Recruitment rates were lower than expected which led to a change in the study protocol to a randomised feasibility trial as funding was limited to 3 years. One reason for low recruitment rates might be overstrict inclusion criteria. More details on study recruitment are provided in the Results section. Nutritional screening was undertaken on admission using the validated screening tool as recommended for use at the Landspitali.3 15 16 A total score of ≥4 is considered ‘at nutritional risk’. After providing informed consent, subjects were randomly allocated to one of two groups. Subjects in group 1 were provided with ONS and subjects in group 2 were provided with snacks (table 1). The intervention started in hospital and was continued for 12 months after discharge from the hospital. The selected ONS were delivered to the patient’s home or picked up at the wholesaler and the food packages were delivered to patient’s home or collected from the hospital, according to patient’s preference. It was assumed that each delivery of ONS and snacks would last for 1 month and 2–3 weeks, respectively. A leaflet designed for this study was provided with pictures of different ONS or each snack and written advice regarding their use such as suggestions on timing of intake, choosing a lower volume (125 mL each) when appetite was poor (ONS) and choice of different meals (snacks). For some items, patients had to portion the snacks themselves, for example, a whole cheesecake, because the minimal available pack size was more than one portion. Verbal advice on the use of each intervention was also given to both groups, for example, ONS should be used from the fridge and snacks with less expiry date should be used first. All patients could phone the study investigator if they needed more ONS or snacks, and every month each patient received a call to ascertain the quantity remaining. 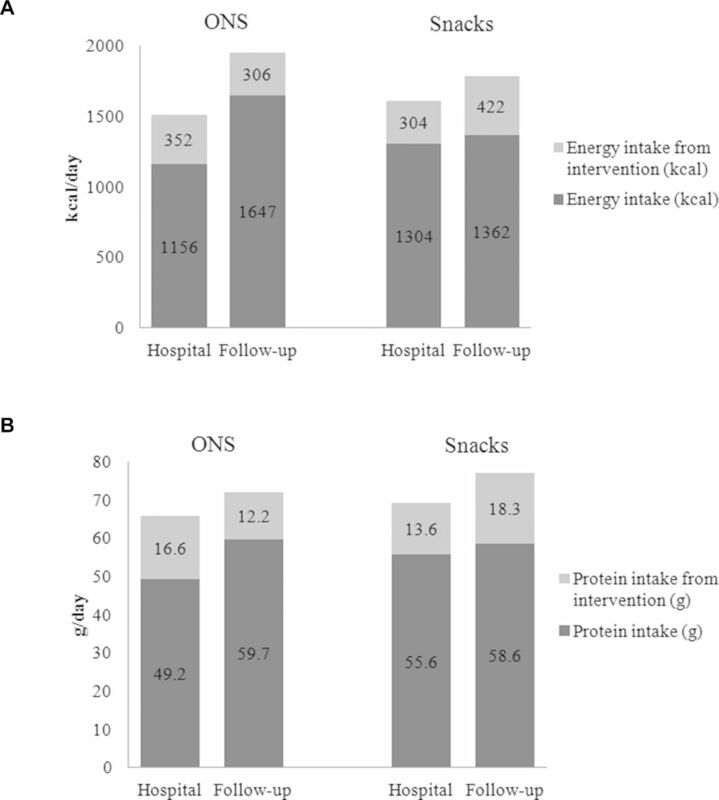 If patients were admitted to hospital during the study period they received ONS or snacks according to randomisation during their hospital stay. During every follow-up appointment and during any hospital readmissions similar time was spent with each group. Outcomes related to feasibility were percentage of eligible subjects that accepted participation (recruitment), percentage of included subjects that finished the 12-month intervention period (retention), the feasibility of undertaking functional assessment and use of ONS/snacks assessed by 24-hour recalls (compliance). Other outcome measures included were forced expiratory volume in 1 s (FEV1) and forced vital capacity (FVC) measured by spirometry (Jaeger MS-PFT, Care Fusion, San Diego, USA).19 Functional performance using several tests validated in patients with COPD were included: 6 min walk distance (6MWD),20 timed up and go (TUG),21 30 s chair stand22 and hand grip strength (HGS)23 measured by a handheld dynamometer (Jamar Sammons Preston Rolyan, Bolingbrook, IL, USA), and energy and protein intake during hospital stay and at home (2 and 4 weeks after discharge). Total energy and protein intake during hospital stay was estimated using a validated plate diagram sheet24 25 for 3 days, starting on the first day of participation in the study and after the intervention had started. Energy and protein intake at home was assessed using the 24-hour recall method,26 2 and 4 weeks after hospital discharge, and analysed using the ICEFOOD nutritional analysis programme.27 For full details of study assessments, see online supplementary appendix 1. All statistical analyses were undertaken using IBM SPSS Statistics V.24 and the level of significance was set at 0.05. Our original power calculations were based on the primary outcome of difference in weight gain between the groups and change in weight to 1 year. Due to low recruitment rate and lower participation rates than expected, post hoc power calculations were performed based on our results. The Kolmogorov-Smirnov test was used to test data normality. The independent t-test was used to test for differences between continuous data at baseline and the Pearson’s χ2 test was used for categorical data. Intention-to-treat analyses were conducted where the last observations were carried forward and used to assess treatment efficacy. All patients with at least two measures (baseline and one other) were included. Repeated measures analysis of covariance was conducted to analyse mean changes in each follow-up. A total of 492 COPD subjects were screened for nutritional risk in the Department of Pulmonary Medicine at Landspitali from September 2014 to December 2016. A total of 145 (30%) were identified at nutritional risk (score ≥4). Thirty-four (45%) of the 76 eligible patients consented to take part in the study, 19 were randomised to the ONS group and 15 to the Snacks group. A total of 42 (55%) refused to participate (figure 1). Those who refused to participate were significantly heavier than those who participated (61.9 kg vs 51.4 kg, p<0.001) and had higher BMI (21.8 kg/m2 vs 18.6 kg/m2, p<0.001). Of those 42 subjects who refused to participate, 6 (14%) were afraid of gaining weight, 3 (7%) did not like using ONS or snacks, 14 (33%) found the demands of the study quite heavy considering their clinical condition, 5 (12%) had practical issues with coming to clinic, 4 (10%) were already participating in another study outside the pulmonary unit and were unwilling to participate in two studies and 10 (24%) gave no reason for their refusal. Consolidated Standards of Reporting Trials (CONSORT) diagram. Study flow chart. ONS, oral nutritional supplements. Twenty-three (68%) of 34 participants completed the 12-month study period. The proportion was similar in each group (figure 1). Of the 11 patients who did not complete the study, two withdrew due to illness and seven died. One repeatedly cancelled appointments and one was unable to be contacted. Three patients were readmitted within the first 30 days of the study (n=2 in the ONS group and n=1 in the Snacks group). There was no difference in cumulative LOS over 12 months between groups (median 40 days (95% CI 14 to 82) in the ONS group and median 46 days (95% CI 9 to 73) in the Snacks group). The total number of admissions to the hospital over the 12 months was 24 in the ONS group and 22 in the Snacks group. Compliance with both interventions in the early postdischarge period was either adequate (2–3 ONS/snacks per day) or greater than recommended (≥4 ONS/snacks per day). The lowest retention rate was in the 6MWD with 12 (35%) patients completing the assessment at 12 months of follow-up, n=15 (44%) completed the TUG, n=15 (44%) 30 s chair stand and n=19 (56%) HGS. The most common reasons for not completing the functional tests were weakness, dyspnoea and fatigue. Table 2 shows the baseline characteristics of the subjects. Both groups tended to increase in body weight from baseline to 12 months (table 3). Mean per cent weight change from baseline to 12 months is shown in figure 2. We are not able to compare the difference between groups as a sample size of 176 subjects (88 subjects in each group) would have been needed to detect a difference of 2 kg in weight gain between the groups over 12 months period (statistical power of 0.8 and a p value of 0.05). A significant increase in FM was seen in both groups. While there was a tendency towards decreased FFM from baseline to 12 months in the ONS groups, participants in the Snacks groups seemed to preserve their FFM. However, changes in FFM from baseline to 12 months were not statistically significant (table 3). Mean weight change (%) from baseline. Intention-to-treat analysis. Groups: ONS, oral nutritional supplements (n=16), Snacks (n=13). Weight loss from baseline to 12 months was observed in 7 (24%) patients (n=5 in ONS and n=2 in the Snacks group). Participants who lost weight were significantly older than those who gained weight (77 (8.7) years vs 69 (6.7) years, p=0.006). There was a tendency towards higher BMI at baseline in those who lost weight compared with those who were weight stable or gained weight (20.5 (3.2) kg/m2 vs 17.8 (3.0) kg/m2, p=0.054), but no significant difference was seen in other variables, for example, smoking status, occupation and QoL. 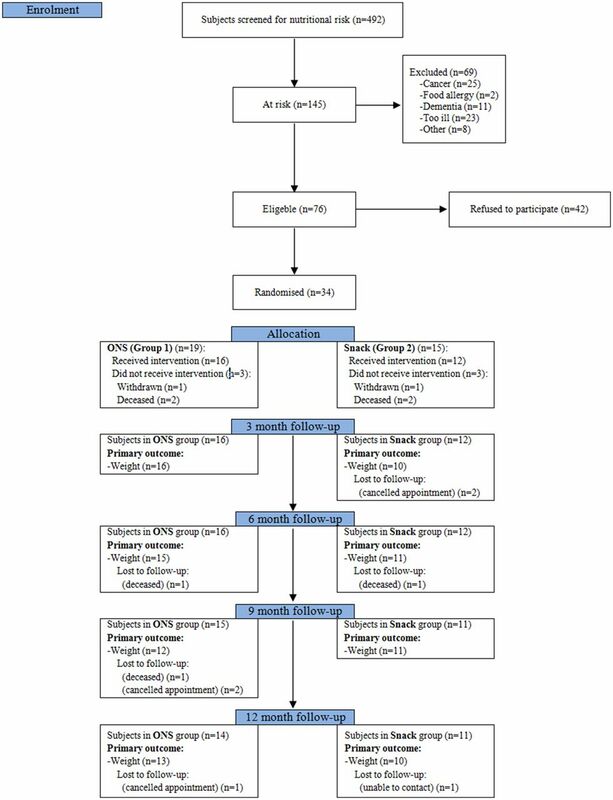 SGRQ total score significantly improved from baseline to 3 months in both groups (table 4). This improvement was maintained at 12 months in the Snacks group (score improved by 8.9 (14.1) points, p=0.041); however, QoL declined in the ONS group as the study progressed resulting in no significant difference at 12 months (improvements by 3.9 (11.0) points, p=0.176). Improvement in SGRQ total score was mainly attributable to improvements in symptom scores. Total energy intake was significantly higher after hospital discharge than at baseline (in hospital) in both groups (figure 3). In the Snacks group, protein intake was significantly higher at 2–4 weeks after discharge than during hospitalisation (1.8 g/kg/day vs 1.4 g/kg/day, respectively, p=0.048), while the increase in protein intake in the ONS group was not statistically significant (1.4 g/kg/day vs 1.2 g/kg/day, p=0.213). (A) Energy and (B) protein intake/day during hospitalisation and in follow-up. Total energy and protein intake per kg actual body weight at baseline, during hospitalisation versus follow-up. ONS: 28 kcal v 39 kcal, p=0.002 and 1.2 g vs 1.4 g, p=0.213. Snacks: 32 kcal vs 40 kcal, p=0.009 and 1.4 g vs 1.8 g, p=0.048. ONS, oral nutritional supplements. No significant changes in lung function (FEV1 and FVC) were seen between baseline and 12 months in either group. Similarly, functional measures and muscle strength remained stable from baseline to 12 months in both groups (see online supplementary table 1). In our study, more than half the eligible participants (55%) refused to take part and one-third of them found the demands of the study burdensome considering their clinical condition. Although similar participation rates have been seen in other nutritional intervention studies in patients with COPD,28 29 it can be speculated that in a study of such long duration and with as many follow-up visits, including tests related to physical function, recruiting patients from outpatient clinics might be more feasible than recruiting patients with exacerbations of disease in the hospital setting. The number of outcomes measured in the present study was extensive. Giving the challenges in getting people to attend follow-up visits and therefore the number of participants on whom data were gathered, the number of outcome measures should be minimised and assessments planned to be undertaken in the patient’s home to prevent excessive participant burden in future studies. Furthermore, there were difficulties in measuring some of the secondary outcomes in those who attended follow-up visits. The reasons might be that majority of our study group (88%) had severe or very severe disease at baseline and as the study continued deterioration in clinical condition was seen in part of the study population. A weight gain of more than 2 kg has been shown to be a significant predictor of survival in depleted and non-depleted patients with COPD.30 In our study, both groups gained weight from baseline to 12 months. While the Snacks group tended to gain more weight than the ONS group (4.4 (6.4) kg (p=0.030) and 2.3 (4.6) kg (p=0.060), respectively), we do not have statistical power to detect significant difference between groups. It is a strength that this is one of the longest nutrition intervention studies reported in patients with COPD, where other studies mostly using ONS tended to last for 3–6 months.9–11 However, information on what happened after intervention in our study is lacking. The Snacks group might continue to consume food similar to what was provided in the study as they are ordinary foods which can be bought in a grocery store. However, the ONS group might not unless ONS are subsidised from the health insurance. It is a limitation that we only assessed compliance with two 24-hour recalls early in the follow-up period. Future studies should formally assess compliance in the longer term. It can be speculated that long-term supplementation is associated with reduced compliance; however, in a systematic review by Hubbard and colleagues, no relationship was seen between duration of ONS prescription and compliance.35 Although some of our patients had previously been advised to take ONS, that is, recently or a few years previously, no patients had previously been provided with snacks. The quantity of the products provided throughout the study period, and gradual weight gain in the subjects up to 12 months after discharge suggests adequate or good compliance in the longer term in both groups. Another limitation is that although positive results were observed in the main outcomes on our study, our sample size lacked power to be able to detect a significant difference between the two interventions in these outcomes. Also, the lack of control group receiving no intervention might be considered as a limitation, but given the results from previous studies we did not find it ethical not providing intervention in this high-risk group. There are also some practical issues related to the approach tested in this trial. Although both interventions were provided free of charge in our study, this is not the case in clinical practice. ONS are partly subsidised or provided free of charge to malnourished individuals in many countries, but general food (snack) is not. Furthermore, the concept of our interventions has not been economically evaluated. Although each snack was cheaper than ONS, the expiry date was shorter and therefore the more regular delivery of the snacks might lead to greater expense. Results from this feasibility study suggest that the provision of both ONS and snacks to patients with COPD is feasible on hospital discharge; however, future trials should be informed of the recruitment and retention issues that have been raised, and the use of functional tests as outcome measures in this population merits further consideration. Furthermore, future studies should include a formal health economic analysis since the cost-effectiveness of the two interventions may not be the same. Acknowledgement to the staff at the thoracic ward and the thoracic outpatient’s clinic at Landspitali National University Hospital, Reykjavik, Iceland, and Eva Bjorg Bjorgvinsdottir for her contribution to the data collection. , 2011. Clinical guidelines on patients nutrition: Landspítali. Available from: http://www.landspitali.is/lisalib/getfile.aspx?itemid=28242 [Accessed 19 Sep 2012].
. 30-second chair-stand test is a valuable evaluation in chronic respiratory diseases. Eur Respir J 2014;44(Suppl 58).
. [Energy and protein intake of patients at the Department of Cardiothoracic surgery, Landspítali - the National University Hospital of Iceland]. Laeknabladid 2013;99:71–5.
. Hvað borða Íslendingar? Könnun á mataræði Íslendinga 2010-2011. Helstu niðurstöður: Embætti Landlæknis, Matvælastofnun and Rannsóknastofa í næringarfræði 2011. Contributors Concept and design of study: ARI, IG, AMB, CB, AR, TG and OGG. Data collection and data management: ARI. Analysing and interpretation of data: ARI, IG, AMB, CB, CEW, AR, TG and OGG. Writing the manuscript: ARI. All authors participated in editing and final revisions of the manuscript. All authors have read and approved the final manuscript. Funding This paper presents independent research that was supported by the Icelandic Research Fund of the Icelandic Centre for Research (141216-051), the Eimskip University Fund and the Landspitali University Hospital Research Fund. Oral nutritional supplements were partly funded by Nutricia (Icepharma) and between meals by MS Iceland Dairies (Mjólkursamsalan). Disclaimer The views expressed in this study are those of the authors and not necessarily those of the funding source. Ethics approval The study was approved by the National Bioethics Committee (VSN14-066-S1), Chief Medical Officer Landspitali (LSH 68-14) and Data Protection Authority (2014/908).